France Insoumise MP Danièle Obono on how Emmanuel Macron's "extreme center" is feeding the rise of the far right. Opinion polls from last year’s French presidential runoff showed that the single biggest reason voters backed Emmanuel Macron was to “stop Marine Le Pen.” Already then, the low turnout indicated a lack of enthusiasm for his campaign; and since his election last May the liberal president has continued to lose support. Ministerial resignations, a scandal over his bodyguard posing as a policeman to beat protesters, and recent fuel protests, have brought Macron to historic low popularity ratings just eighteen months into his rule. With European elections looming in May, the president again seeks to polarize French politics as a binary choice between the “progressive” center and “nationalist” populists. In this cause, pro-Macron media have sought to identify the main opposition to his left, Jean-Luc Mélenchon’s France Insoumise movement, with Le Pen’s own Rassemblement National (formerly known as Front National). At a European level, the president has cast himself as the “anti-Salvini” opposite to the hard-right Italian interior minister. Yet in practice Macron’s record in combatting racism is hardly glorious, with the extension of child detention as well as anti-terrorist measures that have emboldened police harassment of France’s Muslims. 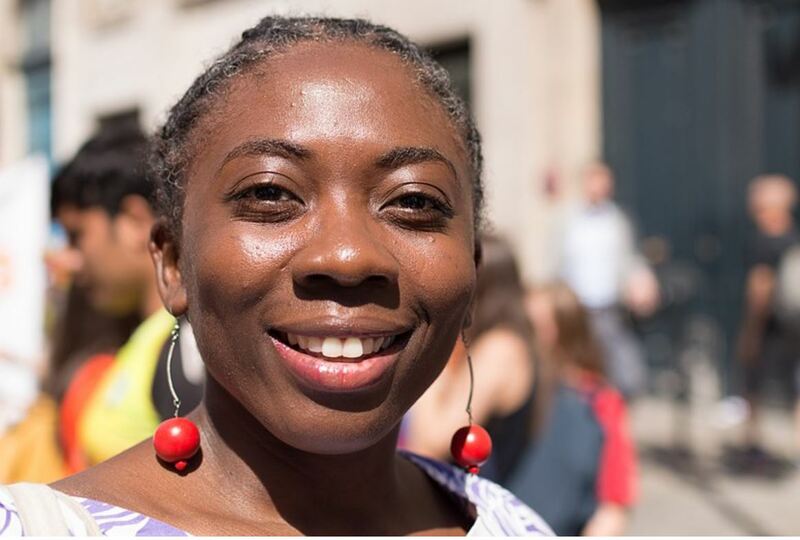 Jacobin’s David Broder spoke to La France Insoumise MP Danièle Obono about Macron’s difficulties, the fight against institutional racism in France, and how elected representatives can provide a “megaphone” for social movements. Last month news of the raids on La France Insoumise’s (LFI) offices spread around the world. You’ve described this as a political and not just judicial affair. Why did it happen now? This whole process began in September. Emmanuel Macron has been polling very poorly, because of the effects of his policies but especially since the Benalla affair [in which the President’s bodyguard was filmed beating demonstrators while falsely posing as a police officer]. In the context of a strong social and political opposition to Macron, France Insoumise’s Jean-Luc Mélenchon reached his strongest-ever polling position, becoming the biggest, most coherent opposition to the president. Against this backdrop, we have seen a whole series of attacks on France Insoumise. Emmanuel Macron has begun a campaign for the [May 2019] European elections in which he claims to stand for the “progressives” against the “nationalists,” putting us and the Front National in the same “populist” basket. The government has itself been in crisis with the departure of [ecologist, center-left] Environment Minister Nicolas Hulot and the Interior Minister Gérard Collomb, weakening it internally. Not by chance, the raids took place on the same day as Macron reshuffled his cabinet. Police raids on journalists and politicians are sensitive enough to be communicated to the upper echelons of government first, so there’s no doubt the prime minister was made aware before it happened. So, it was all prepared well in advance. I think it was designed to weaken the main opposition movement at the moment the government sought to “turn the page.” Macron wants to present himself as the only alternative to the “populists” in this election, and given that middle-class voters are traditionally more likely to turn out, and indeed more sensitive to what the media is talking about, they would likely be more destabilized by this kind of story. You mention Macron’s attempts to posture as the resistance to “populism,” and he has a kind of shadow-play with Matteo Salvini in which each postures as the main alternative to the other. Macron wants to pose as a “cosmopolitan” opposition to the far right, yet at the same time has continued the effective lockdown of the Schengen area [free movement of people in continental Europe] and has outsourced border control to authoritarian regimes in North Africa. What emphasis does your fight against Macron place on resisting his claim to “antiracism”? I would say that his discourse focuses less on antiracism as on counterposing “progressive” politics to “populism.” This latter term is often used by journalists, but its lack of clear definition means it is often misleading; in the political terrain at least, over the last two to three years it has mainly been used to equate the far left with the far right. We do not call ourselves “populist,” but we are proudly dégagiste [calling for the removal of the powers-that-be] and speak of citizens’ revolution and the people as the bases for radical transformation. The term “populist” is a way of calling us nationalists. And this is something that goes back to the way in which Macron was first elected: if you look at the polling on why people voted for him, the biggest single reason was to vote against Marine Le Pen. This was already the case in the 2002 runoff between Jacques Chirac and Jean-Marie Le Pen, with the difference that whereas Chirac won by 82-18 percent Macron won by 66-34 percent. This is the same operation Macron wants to repeat in the European elections: namely, to portray himself as the anti-Salvini. This despite the fact that soon after the Italian election Macron explained that he himself shared some of Salvini’s positions on immigration. Indeed, European summits have moved toward an increasingly repressive policy toward migrants. There is no real opposition on this question. One of the first crises within Macron’s La République en Marche party in the National Assembly concerned migration, because this was the first time we saw an internal disagreement on a bill it presented, with many MPs expressing their opposition. There was a strong mobilization by migrants’ (and pro-migrant) associations, who explicitly opposed the bill. For Macron’s party and his electorate, whether they have come from the Socialists, the EELV [Greens], or even come from the center-right with a humanist outlook, it was shocking to discover how authoritarian and repressive the government really is on this question. Locking up children, and the extension of this practice to a ninety-day period, was a particular focus of controversy. The government and its parliamentary majority rejected all amendments that challenged child detention. Effectively, it’s Trump’s policy: to lock up children simply because they are the children of migrants. This was a point of internal conflict which challenged Macron’s credibility. And a question on which his so-called “progressives” find themselves on the back foot, especially when Interior Minister Collomb adopts far-right talking points about being “submerged” by immigrants or when many pro-Macron MPs call pro-migrant associations “people smugglers.” This, again, is to legitimize a far-right discourse. Or take the case of recent French-African summits: Macron seems obsessed with the so-called “demographic bomb” of African women having too many children, in a colonial and extremely reactionary narrative about black women’s bodies. Macron claims to stand against Salvini, says we are the same as the far right, and presents himself as young, cosmopolitan, and modern. But this is far from the reality. You earlier said that traditionally, in the European elections, middle-class voters have been more likely to turn out. You come from an activist background: what do you see as your role in encouraging the participation of wider layers of the population? Since the presidential election and the creation of our parliamentary group, we have laid a special emphasis on the environmental question and the problem of nuclear power, which is today a key battleground and point of mobilization. The European question is another central issue, for Macron’s policies of social cuts and economic liberalism are the transcription of the assumptions that exist the European level. These are the key axes around which we are mobilizing, in particular in our voter-registration campaign. This is an electoral mobilization which also concerns social rights. Since the 2017 election we have been fighting hard to win over those who usually abstain, but also to build on struggles, for instance environmental and union struggles like that of the women working as cleaners at the Hyatt hotel. In the poor neighborhoods in particular, we have started holding meetings [the rencontres nationales des quartiers populaires] designed to bring together activists and local residents and talk about the fight at the most local level — on housing, on the preservation of green spaces, on public services and such like. This is a question of mobilizing residents who are taking part in struggles, in a way that also facilitates self-organization. Of being useful in people’s everyday lives, for instance with the collection and distribution of clothes, or in Marseille when people came together to redecorate run-down schools. Our meetings in these neighborhoods are part of that: drawing on the thought of activists like Saul Alinksy, this means focusing on very concrete questions such as broken elevators, and working with local associations, social centers, and residents’ bodies. We do the old-style work like giving out leaflets calling for demonstrations, and so on, but we also have to change our way of doing activism, to do more door-to-work to find out what stirs people’s anger and help them on the issues they care about. That isn’t just a matter of the European elections, but of building locally, of being in touch with the population, and ultimately of being in the majority when the next elections come around in 2022: a way of building recognition, and setting a citizens’ revolution in motion, by building the bases of self-organization. You have been the target of heated attacks because of your links to antiracist and anticolonial movements in France. To mention a couple of examples, you were condemned for refusing to say the words “Vive la France,” and have also been subject to “amalgams” trying to attach you to Houria Bouteldja [a controversial decolonial writer]; you have defended her antiracist efforts while criticizing other aspects of her politics. Why do you think you are targeted this way? I think that in general antiracism has long been a blind spot of the Left. And add to that the fact that over the last ten or fifteen years there has not been a mass antiracist movement in the manner there was (with all its limits) in the 1980s. I think that reflects a failure of the Left in government, which has implemented anti-migrant policies and failed to fight discrimination. For some years now, however, there have arisen autonomous antiracist currents which have advanced a certain reflection on structural racism, the reasons why even the Left has much to do in terms of building a postcolonial approach, or why the Left is itself so white and not drawn from a wider range of social categories. That work needs doing. But there is a fundamental problem of strategy and analysis. While there is some advance in terms of research on postcolonial studies and cultural studies, this is much less apparent at the political or even activist level. In this context, faced with both government attacks and the way in which laïcité [French state secularism] is used in an offensive against Muslims, as well as the broader context of the war on terror and the amalgams between Islam and terrorism, tensions emerge also within the Left. For the powers-that-be, the easiest option was to try to use me as such a point of division, as a black and female MP under forty years old. I’m a target for both the powerful and the far right, thinking that I am a “weak link in the chain” they can use to break us. Fortunately, all this was unsuccessful. There are debates within both France Insoumise and not only therein — the analysis of Islamophobia and structural racism and the instrumental use of laïcité create controversy across the French left. But our program has laid the bases of a shared antiracist struggle, which allows us to resist the attacks which try to paint Danièle Obono as close to so-and-so and thus at odds with France Insoumise. There are indeed many different sensibilities, but the point is that we have enough points in common to work together. But do you think France Insoumise has done enough to go beyond the failings of the institutional left on this score, for instance in terms of opposing police violence? We have a very strong position on this issue which Jean-Luc Mélenchon advanced during the [2017 presidential campaign], after the case of a young man raped by police with a truncheon, Théo Luhaka. Several MPs from La France Insoumise, including Eric Coquerel and Mathilde Panot, are present at all the rallies in support of the Traoré family demanding justice for Adama [a twenty-four-year-old who died in police custody in 2016]. In the first parliamentary session one of the bills we put forward sought an end to identity checks, in order to combat the police use of racial profiling. The fight against police violence is a key demand, present already in our program’s sections on racism and discrimination and on justice. This a key front of antiracist struggle, very well-advanced in the movement, and one on which we also work with other collectives, with respect for their autonomy. I am myself a part of the parliamentary commission on questions of justice, security, and policing, so this is a fight both at the movement and parliamentary levels. What exactly is the role you can play in Parliament? This is, to some extent, something we’ve had to make up as we go along. It’s not just a matter of operating within institutions, but of also being involved in the movements. Our strategy for winning power begins from citizens’ movements in which we build our forces, and even when we are in power we will need these kind of mobilizations in order to win the tug-of-war that will surely then arise. We try to be very present in the National Assembly — indeed, we are one of the most active groups of MPs — in order to understand what is going on there and to show that we are able to advance proposed legislation. That is possible because we are also linked to associations, we work constantly on our amendments, to propose bills, to build on the information that associations give us. We use Parliament as a tribune for the struggles and mobilizations that are taking place in society itself. We cannot speak for the movements, or substitute for them, but we can make their voice heard. For example, Caroline Fiat, an MP who was previously a nursing assistant, has worked a lot on questions surrounding old-age care and hospitals, and so can speak out for the struggles in this sector, citing their own words. This is also a way of getting people to listen to what’s going on in the National Assembly itself, because what we say cuts through the general atmosphere of institutional debate. So, the task is to be a megaphone, to carry the movements’ voice, to make them more visible without purporting to substitute for them. Of course, the media don’t always carry that message, preferring instead to talk about pettier matters. You mentioned earlier the attempts by some in the establishment media to divide France Insoumise over questions of antiracism. In recent weeks figures such as former Socialist Party presidential candidate Benoît Hamon have produced collective statements in favor of France taking in migrants, which many left-wing writers and activists have backed but not LFI’s MPs. This has itself drawn criticism of LFI’s alleged sectarianism and silence on this question. Do you think these appeals are actually intended to provoke such controversy over your position? There are both government initiatives — with Macron trying to put us in the same basket as the Front National and Salvini as “populists” — and then an attempt in some media to import into France the debate going on the German left, revolving around Sahra Wagenknecht’s Aufstehen movement. If in its attempts to revitalize the German radical left it has taken some inspiration from us and from Bernie Sanders’s movement, and indeed we have contacts with some Die Linke MPs who are also part of Aufstehen, this is a very partial reading, a strategy of stripping pieces of text out of context and insisting that we take sides on this basis. I think in this there is a lot of political maneuvering and a deal of bad faith, in the attempt to present us [La France Insoumise] as the “anti-immigrant left.” In fact, we have been very active in defense of migrants, I myself headed our group on asylum and immigration, which presented over a hundred amendments to the government’s own bill. This was one of the biggest political battles of the last parliamentary session, followed by the constitutionalization of the state of emergency and then the Benalla affair. We were rightly very active around this, showing those who accused us of not having a position on migration that we were in fact on the offensive. But the debate in Germany served as a pretext to attack us with a variety of baseless polemics. The Communist Party leadership and other currents have launched a series of statements, demanding that we sign up to their positions. Certain forces want to instrumentalize this debate in order to undermine our stance and strip away a few votes among progressive and humanist voters sensitive to these questions. And while we do discuss whether to sign up to these statements, it is difficult to do so when they are so weak politically. This also reflects the low level of mobilization and migrant solidarity, for these are pure petitions of principle, not even saying whom they are addressed to. They take a defeatist stance: for while we can agree on the need to take people in, we also need to address the wars and the free-trade deals that force so many to leave. We don’t have a “no borders” position: we want to govern a nation state and to use the borders for an economic protectionism based on solidarity. For us, this isn’t a barrier to working together in struggles, for instance in showing solidarity with the Aquarius. But signing the same manifestos can’t be a condition of fighting on the same side. Others are, I think, using this issue unfairly and mistakenly at a time when Macron is falsely presenting himself as the anti-Salvini even though he conducts exactly the same policy. And we need a more offensive and clear strategy than petitions can themselves offer. My own constituency lies across the 18th and 19th arrondissement of Paris, and the 18th is the place with the highest numbers of migrants arriving and the highest numbers sleeping in the streets. Over the last year I have been very much confronted with the question of migrant reception, working with associations on the ground. This makes it all the more insulting to then be accused of being against welcoming migrants, when we are fighting this battle all the time. Seeking to break out of the French debate alone, we signed a joint article together with Spain’s Pablo Iglesias and Portugal’s Catarina Martins [of the Left Bloc], seeking a European response, which is what is needed. But at the same time, migration cannot be the central question of the European elections. It is important to defend our own ideas and change people’s thinking on this question. We are for welcoming people in dignified conditions. But we also see how the powers-that-be instrumentalize this debate in a way that only feeds the Front National, at the end of twenty years in which people have been told that immigrants are the problem. Precisely our point is that they aren’t the problem, that the key issue in Europe is the distribution of wealth. That is at the center of our campaign for the European elections. France Insoumise has made an alliance with Podemos and the Left Bloc, expressed in the “Now the People!” declaration. Looking forward to the European election, what do you see as the bases for bringing together these movements, and how can Europe be changed? Something has changed in Europe. When I became politically active Italy was the land of the European Social Forum in Florence, of [the anti-G8 protests] in Genoa, of Rifondazione Comunista; the radical left and the antiwar movement were a point of reference for us all, and the center-left and Christian Democratic left were in office. Now that Left has disappeared while the far-right Lega and the Five Star Movement are in government. The [2014-16 prime minister] Matteo Renzi was the Italian Macron, just as Macron is the French Renzi. This is the confirmation of the way in which the extreme right and the extreme center feed one another. We draw inspiration from the alter-globalization movements, from the European social movements. So, we have the bases for saying what needs to be done differently. The dividing line emerged in Greece, as Alexis Tsipras’s Syriza government accepted the Memorandum from the European institutions. It may have had no other choice. But for us, the important thing is to say that we are ready to disobey the European treaties. The European left is divided by the question of whether it is possible to change things within the existing framework. We and others like us are fighting to change these treaties, a neoliberal straitjacket which is suffocating the peoples of Europe. You cannot change the distribution of wealth within those treaties; so, if the rules remain the same, we will have to implement our program regardless of them. “Now the People” proposes a different way forward: of redistribution of wealth, of public investment, of the fight against tax havens, of ecological transition. We may not all share exactly the same positions on Europe in theory, but the Greek case produced a shared practical view: that we must insist on applying our program even if this demands confrontation. Danièle Obono is an MP for La France Insoumise.